In 2009, Iran errupted into violent protest over the results of an election that Mahmoud Ahmadinejad won by a landslide, leading many to believe that he had stolen the election. As the streets filled with protestors, riot police, and teargas, cartoonists and journalists in the country were doing their part to criticize the government’s response and Ahmadinejad’s election. Among those cartoonists was Kianoush Ramezani. As he watched colleagues being arrested, Ramezani eventually fled Iran in late 2009, finding asylum in France. There are three different groups of Iranian cartoonists: Exiled cartoonists, government cartoonists (who work for the government or who control cartoonists for the government), and neutral cartoonists! 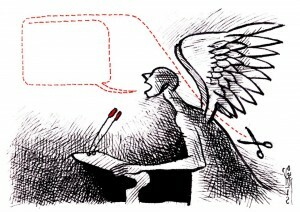 For exiled Iranian cartoonists the most popular themes are the Islamic Republic and human rights issues in Iran. 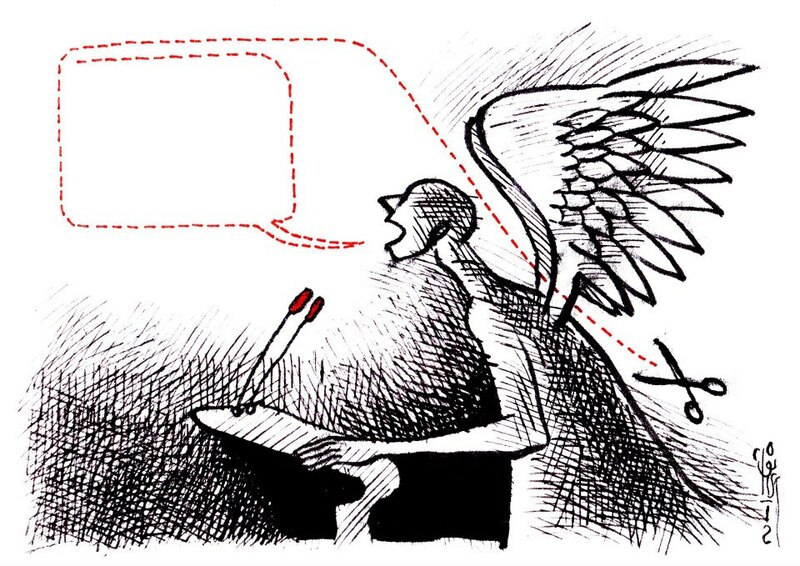 For government cartoonists the most popular themes are regarding propaganda that the Islamic regime likes to use. For example, Israel, imperialism, and generally making fun of western countries. It’s apparent that Ramezani counts himself among the exiled cartoonists, who are less likely to censor or self-censor than either the government or neutral cartoonists. Ramezani is also cognizant of the fact that the most dangerous topic to cover as a cartoonist is Islam, as doing so could lead to imprisonment or even a death sentence. These kind of organizations don’t need to be monitored by the government because they belong to the government! Government-sponsored cartoonists established and control them, and they receive salaries from the government for this! There is also the Iranian House of Cartoon which monitors all cartoonists (both inside and outside of the country) and runs all national cartooning events (like the Tehran International Cartoon Biennial). Ramezani confesses that currently censorship cannot be stopped in his home country, but he continues to comment on Iran’s government from exile, using social media and the Internet to ensure his voice is heard. Read more about Ramezani’s opposition to government suppresion here.